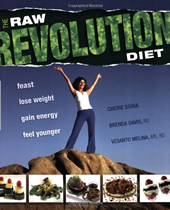 The Raw Food Revolution Diet was created by Cherie Soria, who is a raw food chef and instructor, and the founder of the Living Light Culinary Arts Institute. Soria claims that taking the first step towards better health is easy – simply add more raw plant-based foods to your diet. She promises that by following her program you will ‘lose weight, gain energy and feel younger while feasting on foods that nourish your body and delight your senses’. The Raw Food Revolution Diet is based on the concept of eating raw and plant derived foods. Dieters have an option of undertaking a three week intensive Fast Track Plan that helps to ‘rewire’ the system and reset the taste buds. During this time dieters eat a 100% raw food diet that will help to kick start weight loss. The general plan allows a greater variety of foods than the Fast Track and up to 20% of calories from cooked food is permitted. This approach is designed to help to attain and maintain a healthy weight for life. Juicing and blending are highlighted as a method of increasing the nutritional content of the diet. The book also includes instructions on how to sprout grains, nuts, and legumes. A large component of the book involves detailed nutritional information regarding different aspects of the diet. Dieters learn about calories, protein, fiber, the glycemic index, fats, vitamins, and minerals. Soria’s background as a raw food chef means that the recipes included in the book are delicious as well as nourishing. Many of the recipes are raw versions of familiar items such as pizza, pasta, bread, cookies and ice cream. The book also includes traditional raw meals such as smoothies and salads. Raw vegetables, raw fruits, sprouted grains, sprouted legumes, raw nuts and seeds, avocado, olives, flaxseed oil, olive oil, sea vegetables, mushrooms, tamari, vegetable juice, carob powder, agave syrup, dried fruits, miso, nutritional yeast, herbal tea. Dieters are advised to view exercise as a necessary part of daily life. Daily aerobic activity such as walking is recommended in combination with moderate resistance training and flexibility exercises. The Raw Food Revolution Diet retails at $21.95. There may also be an increase in the cost of groceries as well as for kitchen equipment such as a blender if desired but this is not essential. Allows the intake of a high volume of foods while maintaining the ability to lose weight. Some cooked food is permitted if desired. Includes a seven-day meal plan and a large selection of recipes. Meal plans are designed to meet recommended nutrient intakes. Requires the elimination of a wide variety of foods including alcohol and caffeine. Many dieters experience uncomfortable detox symptoms such as headaches and fatigue when they commence the diet. Difficult to eat out, in social situations or when traveling. May require additional kitchen equipment such as a blender, juicer, food processor and dehydrator. Many dieters will prefer to include some animal products in their diet. Some experts warn about negative long-term effects of a vegan diet. Many dieters report increased energy, improvement of a variety of health concerns and easy weight loss on a raw food diet. However the Raw Food Revolution is quite a strict plan that will require a lot of adjustment for the majority of dieters. Raw Food Revolution will most appeal to dieters with chronic health problems that have not improved by following conventional approaches. “Some experts warn about negative long-term effects of a vegan diet.” Who are these so-called experts? The ADA includes a vegan diet in their recommendations for an ideal diet for all phases of life. I’ve tried SO many diets and this is the only one that works, I can stick to and makes me feel fantastic. I was already practically vegan before I started it and I love veggies and fruit so it wasn’t such a hard transition for me, but I’d recommend anyone try it! Just make sure you take B12 supplements as you cannot get enough B12 from a vegan diet!